The Penguin Swim is one of our largest fundraisers in support of the hospital’s mission to create a coordinated care delivery system that will provide access to quality care, personalized service, and education to improve individual and community health. Each year, hundreds of Penguins raise funds to help the hospital provide the excellent quality care our community depends on. Individual and Team fundraising efforts by Penguin Swim participants enable Atlantic General to continue to provide that care, but they can’t do it alone! 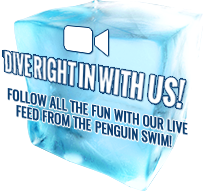 We invite you to become a sponsor of the 25th Annual Penguin Swim! Our sponsors contribute greatly to the event’s success! All sponsors are listed on our event website and AGH Facebook pages, as well as on a sponsor banner at the event, and mentioned in all press and social media up to and following the event. All sponsorships include ads in our Event Program that will be distributed to all participants. With your support, this year’s Penguin Swim will be the most successful yet! If you would like to be an event sponsor, please complete the DONATE form in the amount of your desired sponsorship level. Contact us at 410-641-9671 or penguinswim@atlanticgeneral.org with questions.